WORKS WITH YOUR FAVORITE SPEAKERS. Powerful Class-D digital amplifier powers large or small speakers with 55W per channel. When adding a subwoofer, CONNECT:AMP automatically adjusts the output to send the low frequencies to the subwoofer and the high frequencies to the speaker. No rewiring. No complex programming. 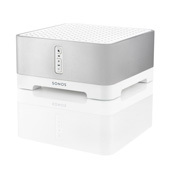 Simply connect a SONOS BRIDGE or CONNECT:AMP to your wireless router and link all your Sonos players wirelessly with one touch.